Harnessing the power of the Surefire ignition system, the Char-Broil Signature TRU Infrared 3-Burner Cabinet Gas Grill is a perfect addition to your backyard kitchen setup. This grill offers ample cooking space, over 400-square inches, for a few friends or family members at a time. It’s convenient cabinet design keeps the propane tank out of sight for a sleek and stylish look. The TRU Infrared system offers even cooking throughout the process and you can easily cook your favorite burgers, fish, or chicken all on the same grill. With the touch of a button, you’re ready to grill your delicious food to have dinner on the table in no time. You may wonder what all the fuss is about the infrared grills that have appeared on the market. The main thing to remember with this is this type of cooking allows you to have more even control of how your food items cook throughout the process. With traditional grills, you can experience major flare ups of flames, uneven cooking temperatures, and food that isn’t cooked completely on one end and burnt on the other. The TRU Infrared system takes all of that guess work out of your cooking experience. You can expect to get juicy, delicious meat off the grill every time you use the Char-Broil TRU Infrared grill. When you’re in the process of grilling up your favorite items, you need to keep an eye on the temperature in the grill. This is easy to do with the lid mounted thermometer on this Char-Broil unit. You can efficiently keep up with where your temperatures are at without disrupting the cooking process. You can leave the lid down and easily see if you should turn down the heat or crank it up for a higher temperature goal. You can know where your status is with preheating and when you’re ready to put the food on for optimum cooking time. When writing this current review, Amazon had over 106 reviews for this particular Char-Broil Signature model. Most of the reviews were in a positive manner and the average score for the grill was a 4.1 out of 5 stars. In most cases, the consumers who purchased the Char-Broil Signature TRU Infrared 3-Burner Cabinet Gas Grill model were very well pleased with their purchase. They loved the unit and would highly recommend it to those who are looking for a mid-sized grill for their backyard patio, balcony, or deck areas. There were some negative reviews, however, on the grill and problems they seemed to have. There were only 24 critical reviews in total. They mentioned issues such as dents upon delivery, difficult to assemble the grill altogether, and they had issues with the porcelain coated grates rusting. Overall the reviews were in favor of this model that is easy to use in a variety of settings. It offers ample cooking area that most found to be sufficient for their grilling needs. On the positive side, customers said things such as … “Awesome grill” … “Great choice” … “Nicely designed” … “We love the quality” … “Five stars” … “I recommend!”. 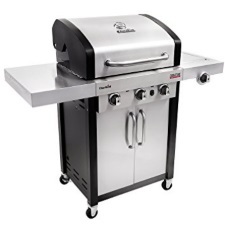 In summary, the Char-Broil Signature TRU Infrared 3-Burner Cabinet Gas Grill seems to be a great option for those looking to add a mid-size grill to their backyard areas. Whether you want to make a backyard kitchen or you want to be able to quickly grill up delicious dinners, this is a great model to consider. At right around $399, it is a budget-friendly addition to your backyard picnic area or setup. The TRU Infrared system and Surefire ignition make it easy to grill your favorite items evenly and quickly. This is a great grill option for those who cook for a smaller group of 2-4 people. Consider this option for your beautiful backyard setup to make grilling your favorite entrees easy and quick.